A nomadic confederation of 5 tribes from eastern central Asia, who, in the 2nd century BC, began migrating westwards under pressure from the Xiognu, who were also expanding westwards from their base in Mongolia, and coming into conflict with the Han Chinese. They were simultaneously encouraged by the weakness of the Greco-Bactrian kingdom, caused by civil war after the murder of its king Eucratides, and the appearance of the Parthians. Under a kind of domino effect the Yuezhi displaced first the Saca in the Ili Valley (between China and Kazakhstan) and were in turn dislodged by the related Wusun people forcing a move through the Tarim basin towards Sogdia. The Saca invaded the Greco-Bactrian kingdom, before turning south towards India. The Han emperor Wudi (148 - 87 BC) sent a mission to the west, hoping to find an ally in the Yuezhi against the fearsome Xiongnu, their common enemy. Chang Ch'ien (Zhang Qian) was briefed to compile a report (which exists as a most valuable document). His mission failed: there was no alliance with the Yuezhi. They defeated and killed two Parthian kings before a third was able to drive them to settle in Seistan (or Sistan, from Sakastan) or the Indus valley. 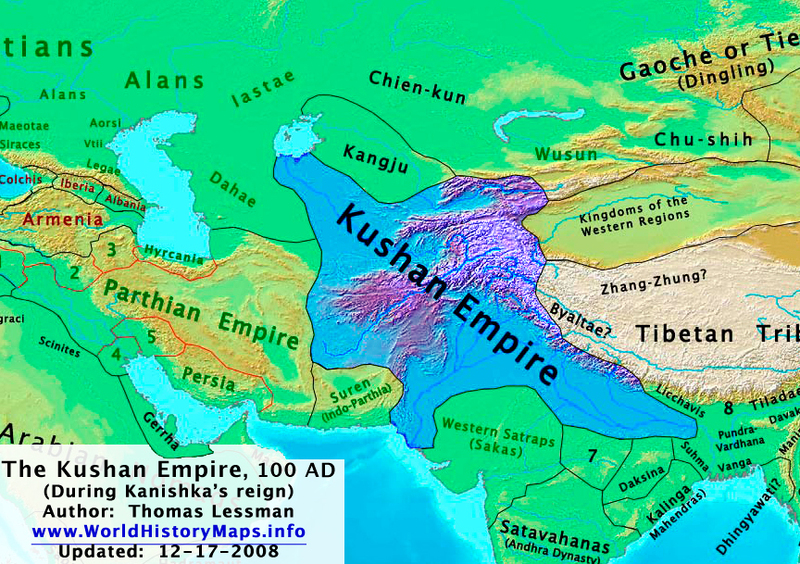 Eventually they established a powerful empire in Afghanistan and northern India, under the name Kushans - deriving from one of the five tribal names, which absorbed the rest. 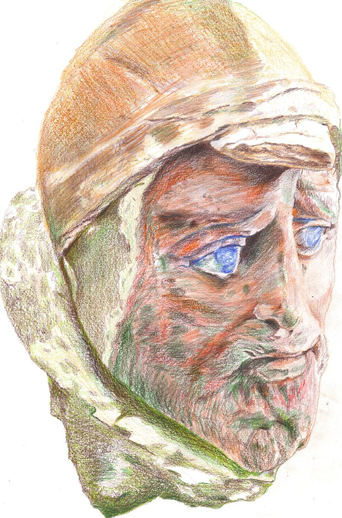 The Kushans were at the high point of their power in the 2nd century AD under Kanishka - his empire stretched from the Tien Shan mountains in the north to the plain of the Ganges in the south. They were important players on the Silk Route - and as enthusiastic Buddhists were a conduit for the introduction of Buddhism to China. They are called Yuezhi in the Chinese sources (sometimes transliterated as Yueh Chi). Greek and Roman authors refer to them as Tocharoi (Tocharians) - hence the erroneous assumption that they were the speakers of the languages in manuscripts from the 6th to 8th centuries AD, discovered by Aurel Stein, and known to linguists as Tocharian A, B and C. "Tocharian" is an Indo-European language (remarkable and puzzling as being a centum rather than a satem language from the east) - the Yuezhi spoke an Iranian (satem) language. The actual Tocharian speakers were apparently absorbed around the 9th century AD by the Turkish Uyghurs , who still predominate in the region. The Yuezhi were famous in China as suppliers of jade from their homeland in the Xinjiang area. Tillya Tepe, the "Hill of Gold"
In 1969 a Russian archaeologist discovered several extrememly rich graves, mostly of women, belonging to a nomadic people dating from first century AD (coins - including one of Roman emperor Tiberius). 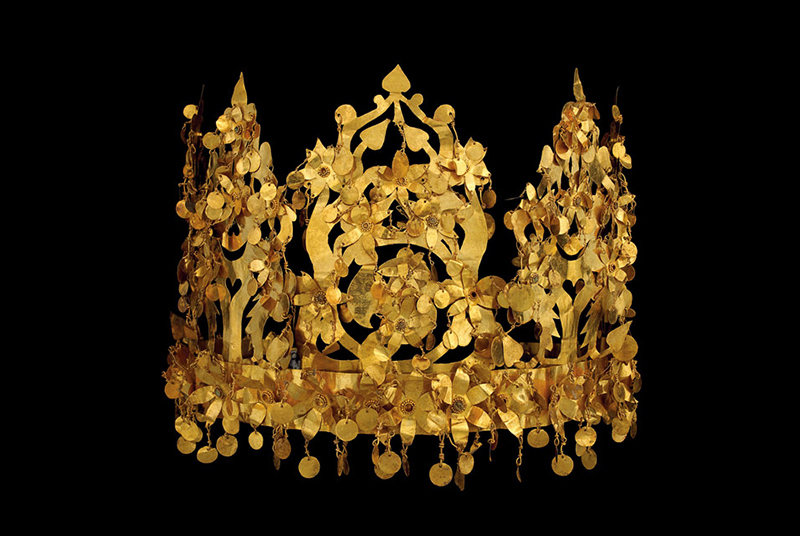 Over 20,000 gold objects were handed to the Afghan National Museum - just before the Soviet invasion in 1979. Miraculously, they survived the Russians and the Taliban. Who were they? Originally they were thought to be Yuezhi or Saca - but other contenders include the Sarmatians and Alans of Kangju., who were at the time vassals of the Yancai, according to Chinese sources. 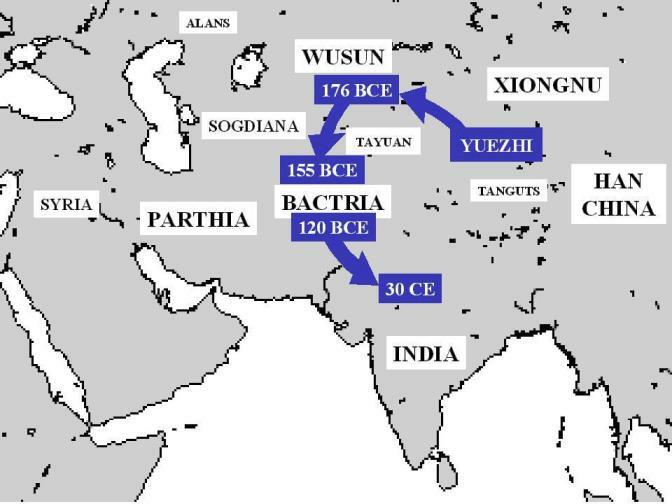 Nomads related to other Iranian peoples who moved from Gansu in western China into Afghanistan and India, where they established a large and powerful empire in the 2nd and 3rd centuries AD. Originally neighbours of the Yuezhi in Gansu. The Yuezhi had previously forced them to move to the Ili valley. The Wusun's revenge came in 132 or 133 AD with Xiognu support. The 5-part crown could be folded uo for travel. It's decorated with stylised small trees, with little birds perched on them - it's remarkably similar tp crowns found in southern Korea, dating from 5-6th centuries AD. Evidence for spread of ideas and techniques among nomadic horsemen across the plains of Central Asia?